Right now, I’m still progressing quite well with my return to climbing from surgery. The weather in Scotland has been rubbish, so much of my climbing has been indoors. Every night, I’ve been working away on my basic balance, ankle and and body strength exercises. It's not very glamourous stuff; just standing on one leg with my eyes shut and making shapes, over and over again. I had some alarming losses in strength to regain. But the nightly work is paying off and I can notice that I can get a lot more weight through my foot on steep ground since I was Spain a few weeks ago. The surgeon is happy with my progress, although he did say there was a fair bit of trauma (osteophytes trimmed back from both my talus and tibia) to recover from. On a rope, I feel reasonably confident now, but in bouldering, I’m still very timid to land for good reason. I went to TCA last night and still have to climb everything as if I’m soloing and climb back down rather than jump or fall. It will probably be good for my climbing to do this for a little while. So I’m in the bit in between being a surgical patient and recovered climber. There is still work to do, but I’m enjoying the progress. As I write, I’m en route to speak at the Bozeman Ice Festival this weekend. 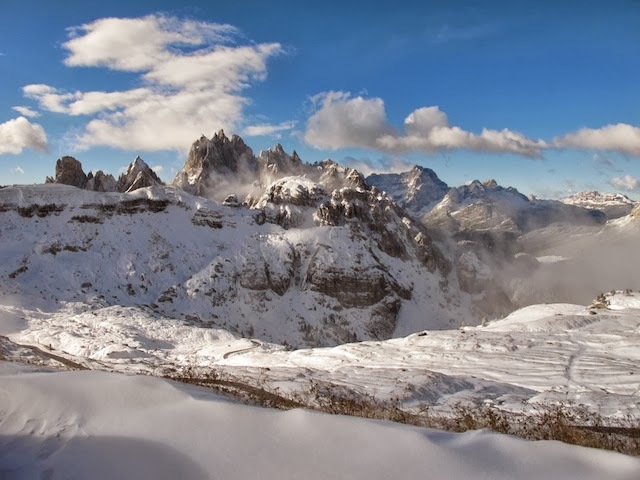 Hopefully, when I return at the end of next week there will be some winter conditions for me to get into back home. Then it’s only a short time until I go on a rather exciting climbing trip! Finally, we just got our copies of the new film from the crazy Belgians in the shop: Venezuela Jungle Jam. 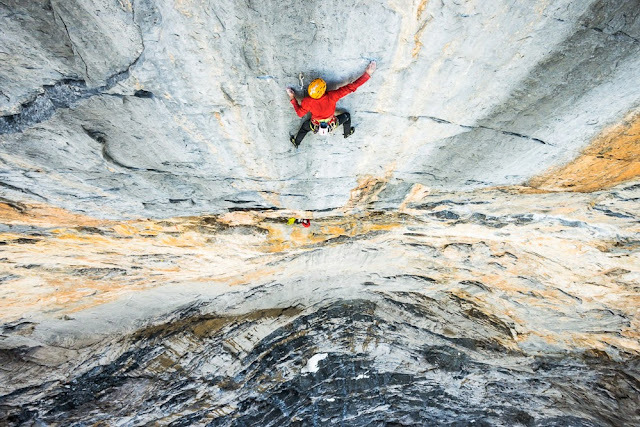 Nico Favresse, Sean Villanueva and their climbing partners are the undisputed kings of making expedition climbing movies. 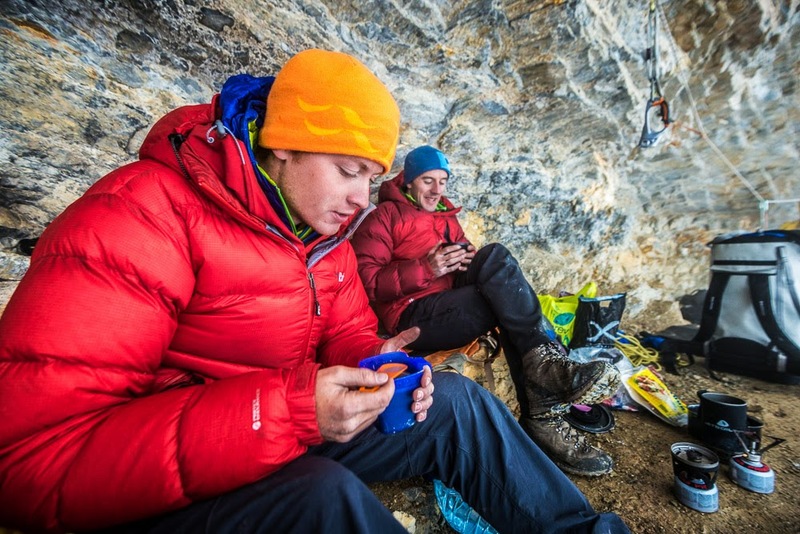 They are also pretty much the kings of making badass climbing expeditions. It’s a killer combination. Their previous films Asgard Jamming and Vertical Sailing have been very popular with you and for good reason. They are two of the most fun climbing films you’ll ever see and full of all the ingredients of great adventure - big characters, thrills and spills and unexpected funny moments. Venezuela Jungle Jam is the latest in the line! It’s already picking up a string of awards on the film festival circuit. 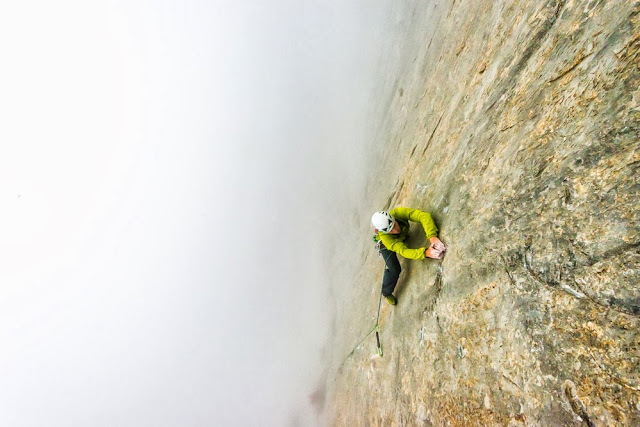 In this film they are off to the amazing 500m sandstone Tepuy of Venezuela to deal with sweaty jungles, wild animals, loose rock, falls, overhanging big walls and, always, jamming on the portaledge. The climbing looks challenging, in just about all the ways it could (apart from being cold). The scenery is gob smacking and as you’ll just about see in the teaser (it really is a tease) Sean’s superb sideways plummet off a ledge is another one of those ‘oh my god’ moments we almost come to expect from these guys. Brilliant stuff. The DVD is 58 mins plus extras, Subtitles in English, Spanish, Dutch, Italian, Polish and German. I’ve also just added the Distilled DVD now we have our DVD stock, so you can either download it, or get it for your winter partner for Christmas! 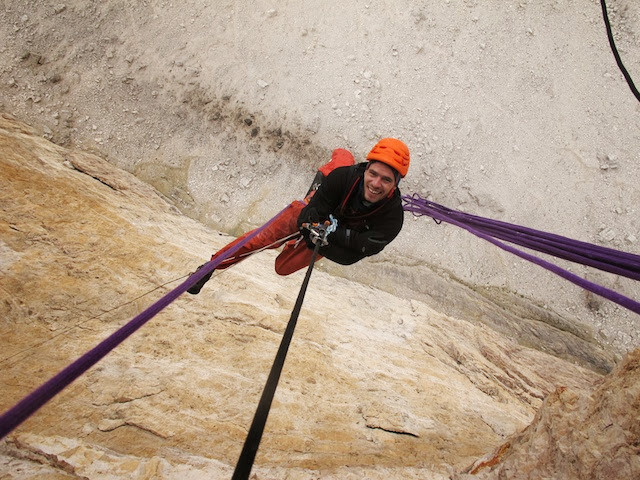 I’ve just added two new climbing films to the shop. First up is Distilled, Hot Aches Productions new film about Scottish winter climbing with Andy Cave. There are still only a handful of films out there about Scottish winter, and of these, one one or two really good ones. So it’s great to see another. Andy explores what is so special about this ‘distilled’ form of alpinism by going climbing on all types of routes from the classic mountaineering routes like Tower Ridge to proper hard mixed in proper wild conditions. Inspiring and timely stuff. You’ll find Distilled in the shop for HD download and the DVDs will be with us in a few days. 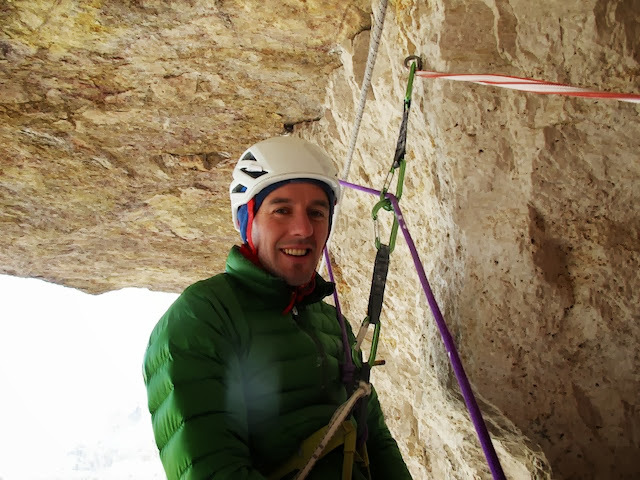 Next is The Last Great Climb DVD, Alastair Lee’s latest film with Leo Houlding. Leo increasingly these days is going on some pretty badass expeditions to far flung places. Ulvetanna in Antarctica is just about as far flung as you can get. It’s a jaw dropping mountain to look at and the line they managed to climb on it just looks sensational. As you might expect with Alastair, although it’s heavy on the cheese factor at times it is very well filmed and a great adventure. One to make you think twice about just going down the local wall and booking a ticket to the other side of the world instead. I came back to my big traverse project, which unfortunately was quite wet. However, good progress can still be made even though I can’t try all of it. With fresh eyes, I spotted quite a few changes to my sequence that seem so obvious now, but didn’t before. It always makes me smile when that happens. Why don’t you see an obviously easier way to do a move before, but having had a wee bit of time away, it’s obvious? Who knows, but it’s nice anyway. I felt like I almost did the project just before I went in for surgery. So I'm gunning for a dry day where I can get a chance to see where I'm at on it now. My ankle continues to have up and down progress. I can now do some rather shaky one-leg calf raises, which were completely impossible 1 week ago. I can also bat hang again. However, although I can hang upside down from holds by my toes, walking up mountains is still challenging. I tried a longish walk over classic tussocky Scottish bog, in search of some new crags. I found a great deep water soloing venue 5 miles from my house! However, after 45 minutes, it hurt. So at least another week of bouldering, training, physio, book editing etc. Maybe I’ll see some of you on Thursday night in London for my talk at the Royal Geographical Society. In my last two days in Margalef, I managed to keep up the progress with my surgery rehab. I had a quick try on another 8c and although I got it in two halves, I still wasn’t able to get much power through my left foot or move with any confidence. However, even the next day I could feel it getting better and actually got fairly close to doing the route. My body movements are still feeling pretty foreign. That might sound a bit silly, but it’s a difficult sensation to explain. Because I climb a lot and have climbed for years, my brain has such a strong expectation of how my body ought to move. So when it doesn’t function that way, it feels like it’s someone else climbing. On my last day, after a couple of quick tries on the 8c, I got a bouldery 8a+ redpointed in half an hour or so, and a 7c+ onsight. On both of those, although I’m still far off fitness, I felt a bit more myself during the climbing. I can’t tell you what a satisfying feeling that is. So now I’ve had a handful of climbing days to get me started, I’m heading back to Scotland and can try and build a base of fitness and confidence again. The next stage is to be able to walk up a hill again. After this trip I’ve consolidated walking for 10 minutes or so on uneven paths. So if my upward progress continues I’ll hopefully manage to walk a mile or so, and then I’ll shoot for walking up a Munro and climbing 8c again. My goal (if it’s not to cold now) will be to complete my 8c project at Ruthven as soon as I can. The rest before the crux has a left foot toe hook though, so I might have to try powering on through instead! [Update] Since writing the post above I managed to miss the last tube train back from a gig in Glasgow and walked at least a mile through Govan in the wee small hours to find some transport home. It might not count since it was under the influence of a few analgesics. I'll take it as further progress anyway. Tomorrow is 4 weeks since my ankle surgery. I’ve had just as many ups and downs as I expected. At first, I was going great guns, ditching my crutches quite early on and starting to walk quite freely around the house. In the second week, I even had a 15 minute climbing session on easy problems at the Ice Factor. Then the ankle became infected, I got antibiotics, they made me get really sick, then it got super swollen and exquisitely painful. All of this coincided with a family trip to Fontainbleau, the first day of which I spent lying as still as possible in bed with a fever. After that, I was of course desperate to climb. The next day I did one 7B+, and paid for it for the rest of the week, limping around generally feeling pretty rough. Back home and I managed to get through a couple of days coaching and lectures in Scotland before getting on another plane to Margalef which I’d arranged long before I’d even had the ankle problem. 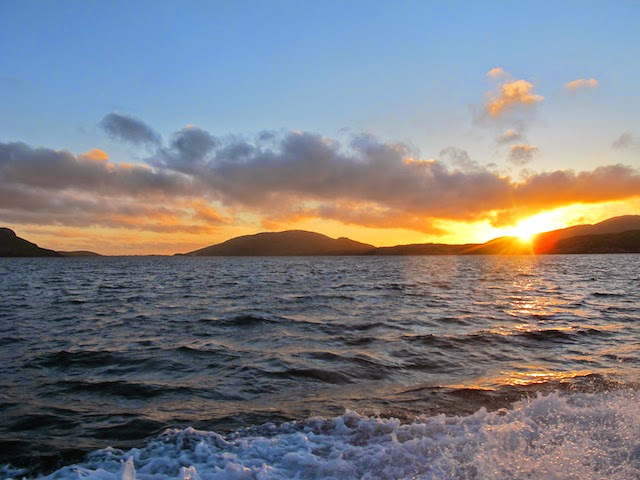 When I woke up on the first morning, I wished I’d just cancelled the trip. I’d been hopeful I could begin climbing by now, but the ankle was still really swollen and angry. A 200 metre walk to the crag nearly had me in tears. More antibiotics, rest days and lying down with my foot in the air seems to have brought a breakthrough at last. Yesterday, I made another tentative start. A 7a+, a 7b and a laughable attempt at an 8c. I know that my confidence won’t take too long to get back, but yesterday felt like I was 16 and weak again. I’ve lost a lot of confidence to be aggressive with my feet and get body tension. To be expected of course. Today felt slightly better again, with 7b+ onsight and an 8a redpoint, and the crag was about 10 minutes walk from the car (the crux of the day!). Tomorrow I will rest and then we’ll see if I can make another little step in an upward direction. I’ve just added a couple of new books in the shop. Both are must reads for anyone keen for inspiration and information on climbing, but both are very different. The last book is a long awaited guide to some of the finest lumps of rock in the UK. First up is Julian Lines autobiography ‘Tears of the Dawn’. 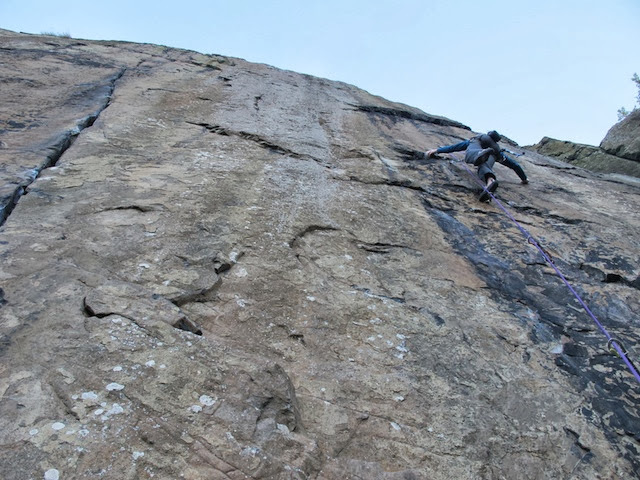 I imagine most of you will not need introduced to Jules, who has been the ‘dark horse’ of the bold trad and free soloing scene in the UK for the past 15 years or so. I’ve done a couple of his routes myself such as Firestone E7 6c in Hell’s Lum which is archetypal of his climbs - no gear, not really any holds either. Just a deep breath and a lot of trust in the frictional properties of thin granite smears. Many of the nailbiting adventures he’s had over the years involve free soloing, by himself on the quiet mountain crags of the highlands. But he’s also well known for his deep water soloing exploits, not to mention jumping off cliffs and paragliding. He’s hit the ground from a long way up too many times to mention, but is either a very lucky man or has bendy bones. It’s a great window into the mind of an solo adventurer, but very much the opposite of an Alex Honhold type of character. Next is The Art of Ice Climbing, a lovely book which is part coffee table inspiration book, part technical manual. It’s a great production with interesting historical and new photography throughout. It has excellent advice sections on sharpening ice tools, screws, ropework and techniques for ice climbing. I think just about any ice climber would learn something new here. In the past there have been some great books on ice climbing that every climber should have on their shelf. I reckon this is the latest in that line. Lastly, I’ve added the new Torridon bouldering guide which is finally out by local activists Ian Taylor and Richie Betts. It’s great to see this guide finally out. 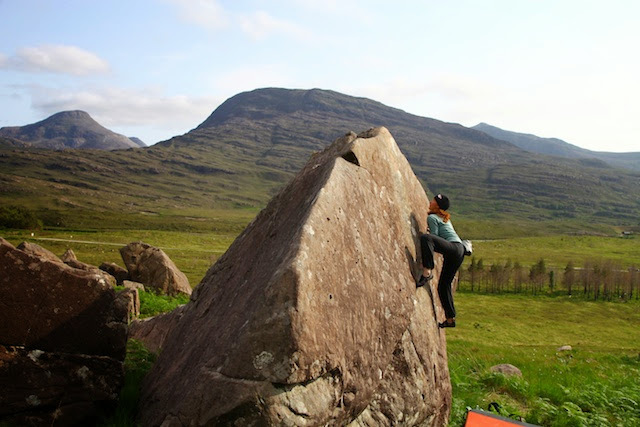 The rock at Torridon is the best I’ve climbed on in the UK. It’s truly amazing stuff, and many of the problems are amazing natural lines too. The guys have done a great job producing this guide which contains around 250 problems to go at, and of course many first ascents still waiting to be explored. You’ll find all of these, along with the rest of the best climbing books, films and gear out there in the shop. I’ve just added a new climbing DVD to the webshop. It’s the double DVD of two BBC programmes I shot last year. The first is a re-enactment of one of the first recorded climbs in the UK; a crossing by three men from the Western Isles onto the Great Stac of Handa in 1867. It was quite an experience to recreate their feat of daring and a window into a way of life now long gone. The inspiration to make a film about it came from an essay by Tom Patey in an old SMC journal, where he expressed his amazement at the strength and ingenuity of the Lewismen for rigging up a rope successfully and climbing across the huge gap to the stac. Patey himself had found the crossing desperate. To film it we had to get a 400m rope that was really thick (it weighed 45kgs) and cart it across Handa and then set it up spanning between the headlands on either side of the Stac. It was quite amazing the Lewismen thought to do it that way. The second film couldn't be more different. The huge networks of limestone caves underneath the dales of Yorkshire and the Peak District obviously have some fantastic rock features, but they aren’t normally visited by rock climbers! 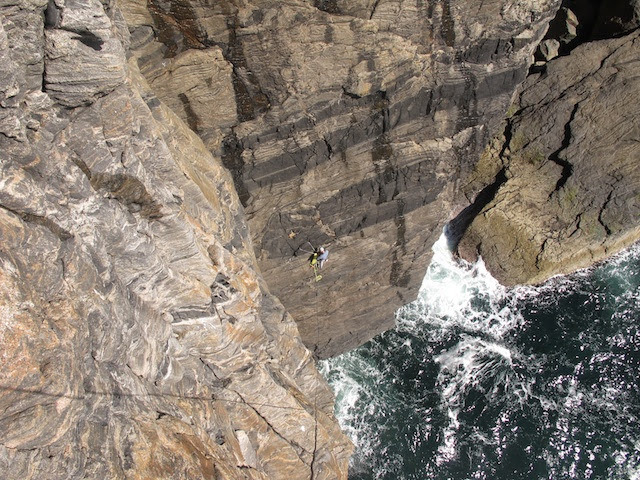 Myself and Alan Cassidy went on a wee mission to see if there was good rock climbing to be had in the caves. What we found was pretty adventurous and definitely out of the ordinary. First off we climbed the a big circular chamber of Jingling Pot in Yorkshire. It went at about E3 although that obviously doesn’t do it much justice since it was running with water and totally dark. 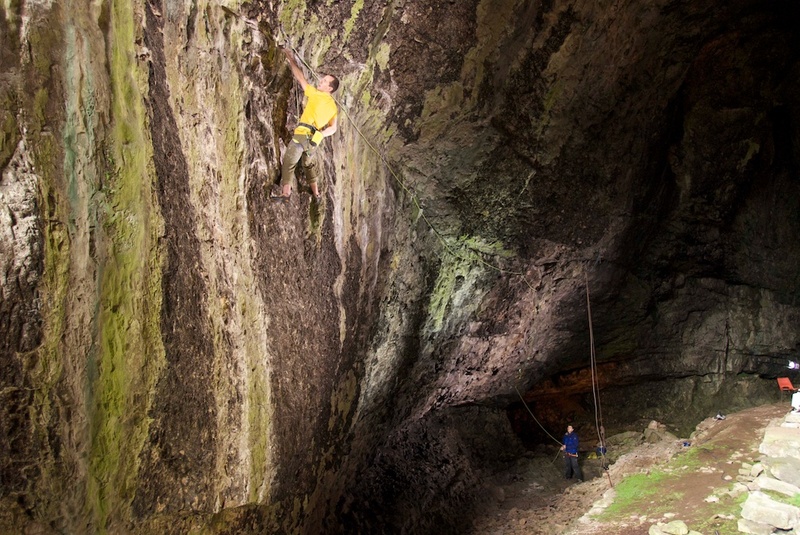 But that was just a warm up for the 4-pitch monster 7c+ we climbed in Peak Cavern - the biggest cave opening in the peak, and our route was the first free climb In the whole cave. It was quite a lucky and special experience. Both programmes are 1 hour long. It’s in the shop here. Things have gone well for me. Much better than I expected. 48 hours after surgery, I was on the campus board in TCA and doing easy problems foot-off. After my surgery last year, I couldn’t face this for nearly two weeks. By day 4 I was hobbling a little in the house and at day 7 walking quite normally, if still for very short distances. Of course I’ve had a couple of ‘sore’ days. Yesterday I didn’t feel like doing anything too far from a sofa until it was time for my physio session in the evening. I’ve still not ventured out for anything more than a few minutes walk. But I’m well happy with the progress so far. Now I have my big fat bandage off, I can see that my foot is not so far from a shape that would accept a rockshoe. The huge difference between this and my much slower progress in last year’s operation on the other ankle might be accounted for because the joint was much less ‘hot’ at the time of surgery. I.e. I was walking around on a partially functioning foot rather than on crutches on a swollen, angry ankle. Ivory Coast Font 7c+ from Dave MacLeod on Vimeo. On the way home from the Dolomites the other week, I stopped by at the Ruthven Boulder near Inverness for a session. Blair Fyffe had just added a long traverse at Font 7c (or route 8b - it’s 20 or 30 metres long!). Blair wrote a nice blog about it here. There was an obvious extended start to make it a bit more complete and I thought I’d have a look at that. I repeated the traverse from Blair’s start after a suss of the moves (I’d say it’s more like route 8a+) and then did it from the extended start which adds a great section across the roof on the left side of the boulder. This definitely knocks it up a grade to route 8b or Font 7c/+ish. It’s a classic endurance workout and dries very quickly, so I’m sure it will be keeping local climbers fit in the coming years. If you want the beta, check out the video above. Blair's trav starts from the big jug I bat-hang off. Thankfully, it isn’t over there. Where the traverse goes up a level at the crux of ‘The Big Lebowski’, there is an obvious low variation dropping down a bit and continuing on tiny crimpers. After two or three sessions, just before I headed to Glasgow for surgery, I almost got it. So I have something to go back to as soon as I can climb again. The crux is quite a lot harder than the high traverse and it’s going to go at around route 8c I think. Can’t wait to return.. I was lucky enough to be able to climb recently despite my pending ankle surgery yesterday. For my last day before the appointment with the knife collection, I decided to team up with Alan Cassidy to go on a very inspiring project. The wall right of Rhapsody at Dumbarton was bolted in the early nineties by the ever optimistic Andy Gallagher. Various very strong people had tried it and noone had made much impression on it. That’s a shame since it’s one of the best lines at an amazing crag, with superb rock and moves. I had a brief play one cold day around 8 years ago. I felt it was just possible but might be upwards of 9a+ minimum. 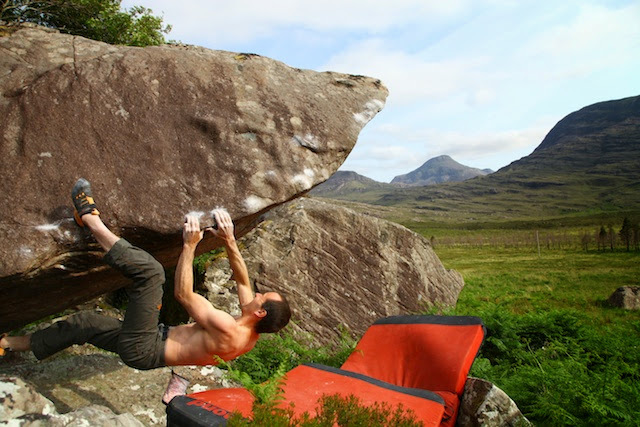 I was getting kind of ‘full’ of climbing at Dumbarton at the time and left it for a life in the highlands. I had a play and was most heartened to be able to do most of the individual moves. It’s clear that it goes and it’s pretty inspiring. I found it kind of ridiculous to be back there after several years, working on the line I’d left behind, thinking that some youth will come along and do it. That will probably still happen, but it’s surprising to me that it hasn't already. There are plenty of folk with the finger strength. All it would take is the attitude. Anyway, it left me with a nice feeling of inspiration with which to enter surgery rehab mode the next day. I didn’t have to be in hospital until 2.30pm, so at the last minute I jumped out the door first thing and was at Lennoxtown for 8am to look at the other arete project Alex had told me about. I found it (at least I presume it’s the same line?) and it looked amazing! I settled into figuring out it’s exquisite moves for around 30 minutes and realised I was quite close to getting it. Unfortunately it was raining heavily and the sloping topout was running water. I linked it from the start to the topout three times but wasn’t able to pull over on the soggy slopers. Unfortunate, but I’ll still enjoy it when I next get the chance to get on it. After that it was back to reality and a sober drive to hospital to get cut up. The surgeon and staff did a great job and everything went well for me. 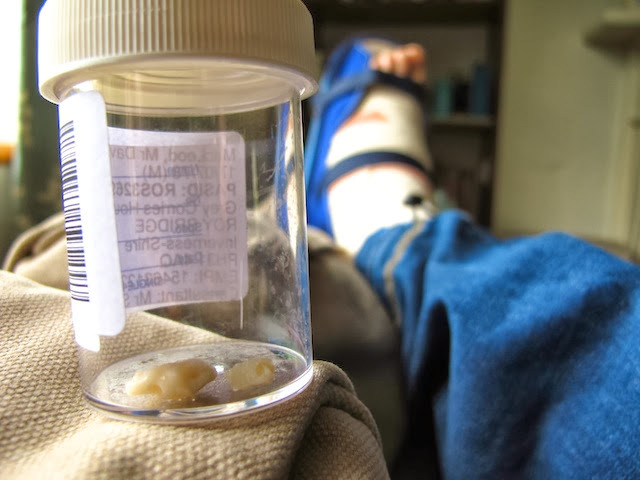 I was quite terrified of what the surgeon would find in my ankle joint. But it ended up not being as bad as I feared. He pulled several large osteophytes (i.e. Loose chunks of bone) out of the joint and gave a couple of them to me afterwards. I’m not totally sure if they all broke off when I fell off Hold True the other week, or some time before that. Either way, I’m glad to see them out. Right now, on day one of recovery, I’m totally psyched to get started on a return to fitness. It’s always refreshing to start with a clean slate and reassess all aspects of your game - What climbs do I want to do? What physical weaknesses should I take time to address? There’s plenty to be getting on with. A good while ago I wrote some posts about Mountain Rescue and ideas on how they might improve their funding. It’s good to see some new developments there: Scottish Mountain Rescue, who represent and co-ordinate the individual rescue teams across the country have secured some corporate sponsorship from Isle of Skye Whisky. 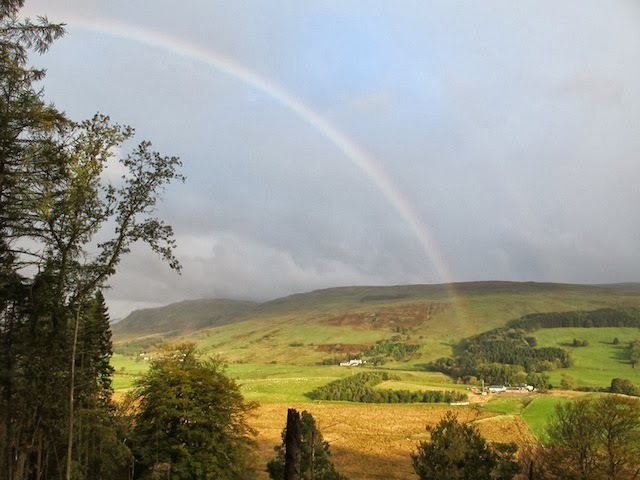 At the moment, rescue gets some funding from the Scottish government, but it’s not nearly enough to keep the teams going in the ever increasing costs of rescuing folk in the Scottish mountains. For those of us who live around Ben Nevis for example, the seemingly nightly buzz of the rescue helicopter through the winter is a reminder of just how hard they have to work and how much the service is pushed these days. Donating when and where you can really ought to be something all folk who go into the hills should do. So many of us have a friend or relative who has needed a rescue, or will do one day. Odds are it will save that person’s life. So it’s important. You can do it easily here, by the way. I was asked to go along to the launch day of the campaign that Scottish Mountain Rescue and Isle of Skye Whisky are starting in Glen Nevis to take pictures to publicise the campaign in the papers and speak to Reporting Scotland. The amazing SARDA rescue dog sat stock still for 20 minutes for these pictures. As well as encouraging direct donations through their ability to attract a lot of attention as a big company, they are donating 15p per bottle of whisky sold to Scottish Mountain Rescue. I hope it raises enough to keep the teams equipped and able to keep doing such an amazing job. I hope I never need them myself, but I certainly am thankful that they are there. Oct 26th Dundee: I’m speaking for Tiso and the Dundee Rucksack Club for their 90 anniversary celebration. Tickets and more details on that coming shortly on Tiso’s site. 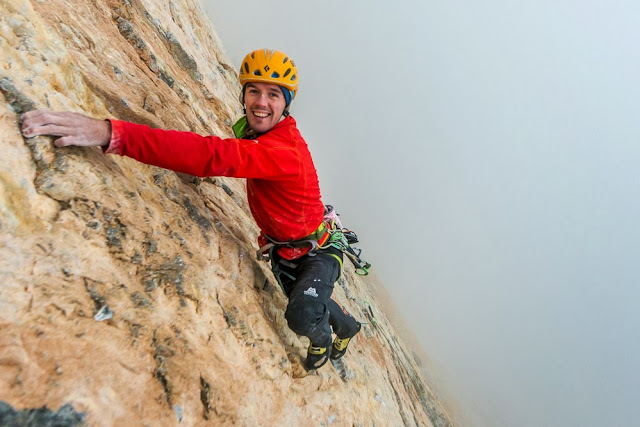 Nov 3rd: I’m speaking at the Ice Factor’s Festival of Ice and running climbing masterclasses in both rock and mixed climbing. The Festival will be a mega event. You should check out all the things that are going on there. The technique classes will fill up quickly so you should call Claire on 07813060376 to book a place. 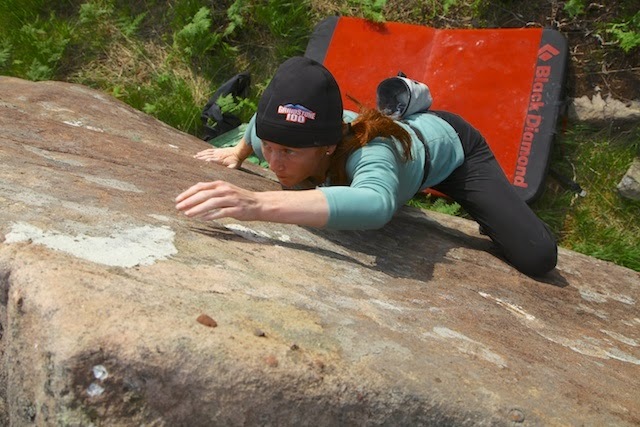 I’ll be running the rock technique classes 10-noon and 4-6pm, the mixed/dry tooling class 2-4pm and giving a talk at lunchtime. Cost is £40 for a place on one of my classes. The event is to raise money for Climber’s against cancer. Nov 4th Aberdeen: I’m speaking at the Aberdeen Tiso store. Tickets available at the store, £5, although you can enquire online about tickets from here by clicking on the start time at the bottom. Nov 28th London: I’m speaking at the Royal Geographical Society for their annual Porter’s Progress lecture. Tickets here. Dec 13th Bozeman Ice Festival, USA. I’m speaking at the festival and running ice/mixed technique clinics on Dec 14th. June and July were some of the most busy and challenging days of my life, none of which involved any climbing. The death of my father Norman was not a good time. Not wishing to talk about it much more on this, my climbing blog, all I should say is that at least I was able time to spend time with him first. So my planned trip to the alps with Calum Muskett crept up on me. I’d done next to no climbing for several weeks with everything that had gone on. A few fingerboard sessions, a couple of TCA sessions, that’s it. I could still one arm a first joint edge. But endurance was nil. 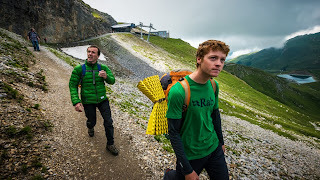 Here mate, is that the Eiger? 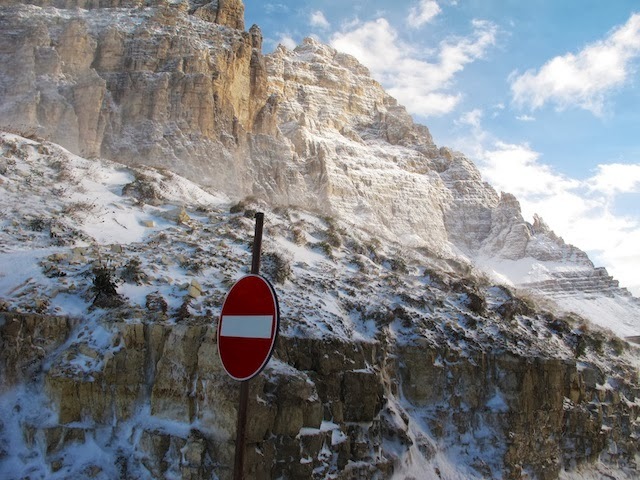 When I started to drive south from the highlands, the extent of the problem with this started to dawn on me, since our discussed objectives were basically a list of the hardest routes in the alps. 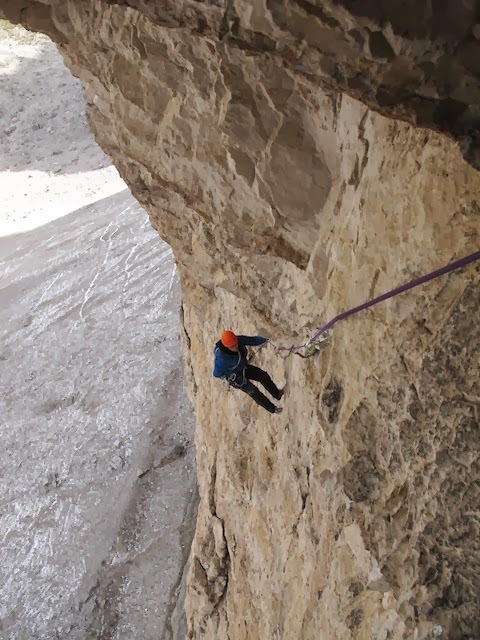 Top of the list was Paciencia, the hardest route on the north face of the Eiger. 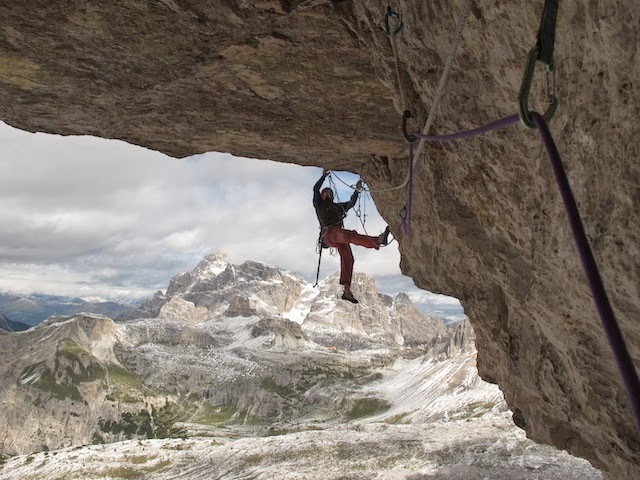 First freed in 2008 by Ueli Steck and then repeated just once by David Lama in 2011. Reading Lama’s blog made me wince. He rated it one of the hardest routes in the alps and said he was utterly exhausted by the time he reached the top. Although the pitch grades don’t too bad; 6b, 6a, 6a+, 7c, 7c, 7a, 8a, 7a+, 6b+, 6a+, 6a+, 7c, 7c+, 7b, 7a, 6a, 7a+, 7c, 7a, 6c+, 6b, 6b, 6c+ Many of the pitches are tad on the sandbag side. For instance, one of the 6b+s we thought translated to E4 6b. On paper it was completely ridiculous for me to go near it. However, predictably, after meeting Calum in Chamonix we decided in about 2 minutes we’d head straight to the Eiger for the first route. 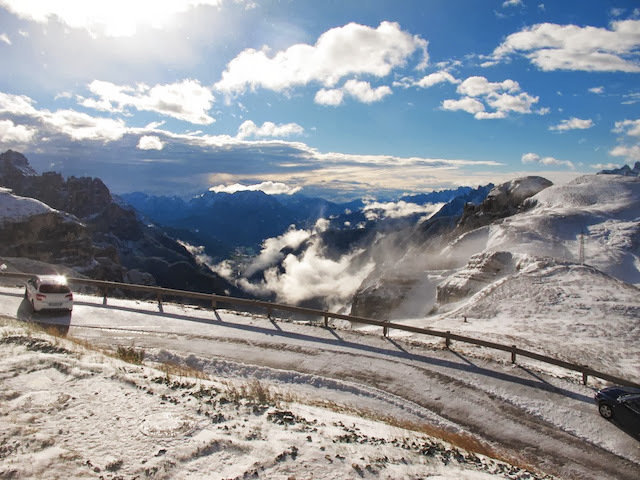 It would also be my first alpine route. A day later we were scrambling up the classic 1938 route to the foot of Paciencia. 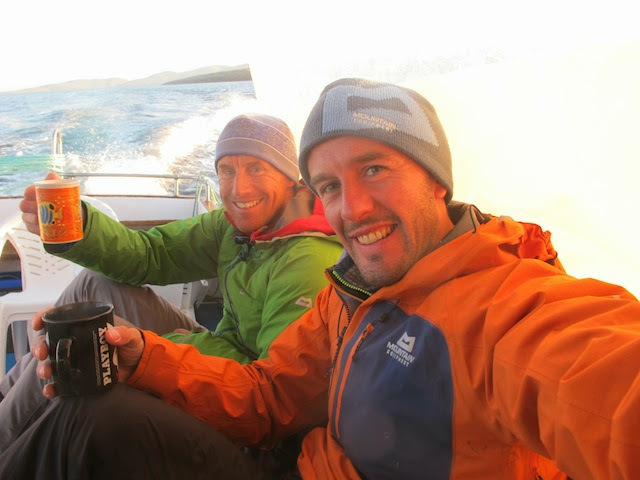 It was misty, damp and cold and after a drippy bivi I woke up ready to fail. Thankfully, our intention was just to have a recce and get our bearings on the Eiger. 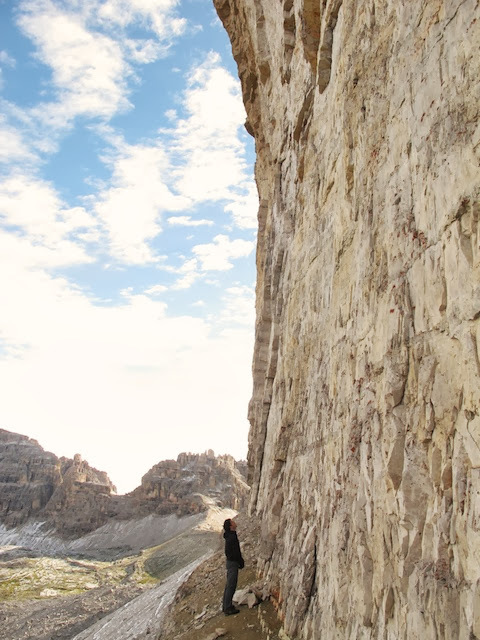 That day we hung about on the first few 7c and 8a pitches and I tried to give myself as big a workout as possible. I achieved that goal with ease. I wasn’t sure about going back up. Perhaps it would be better to do a few easier routes first? I couldn’t think of a good way to even suggest that to Calum, who is already an accomplished alpinist, just a couple of years younger than me at 19. So we went back up, taking the photographer Alexandre Buisse with us for the first day. 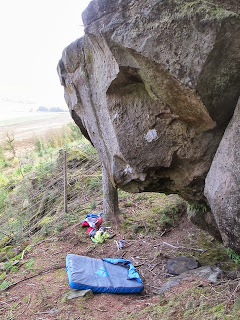 After soloing back up the 38 route in the afternoon we bagged the first few 7c pitches before dark and settled into our bivi, ready to go for the 8a in the morning. The morning however, was mostly spent melting snow to fuel some serious tea drinking on our ledge. Once we got started, we both dispatched the brilliant 8a pitch with much enjoyment. What an amazing pitch in spectacular surroundings. 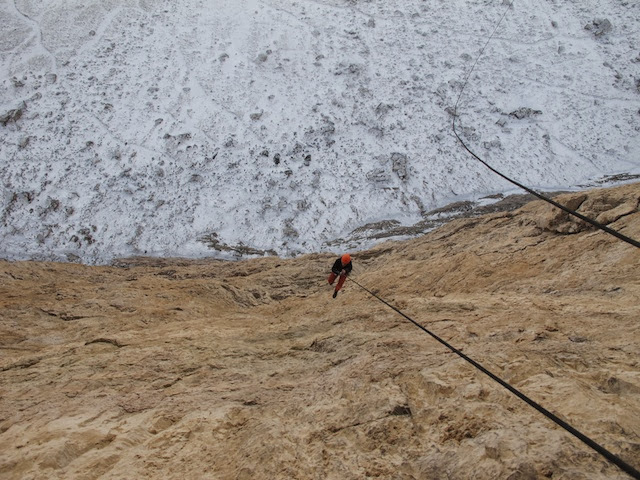 Our clear objective was for both of us to free the entire route with no falls, whether leading or seconding. All of the many 7b and 7c pitches were very hard to onsight, as we already knew from reading David Lama’s account. 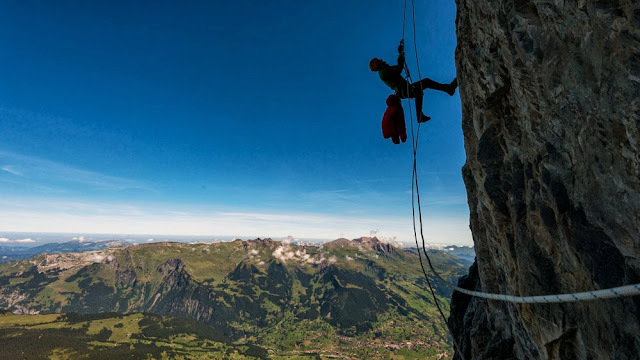 So we decided to give ourselves three full days to climb to the top since we would need the extra time for both of us to succeed on each of the 23 pitches. 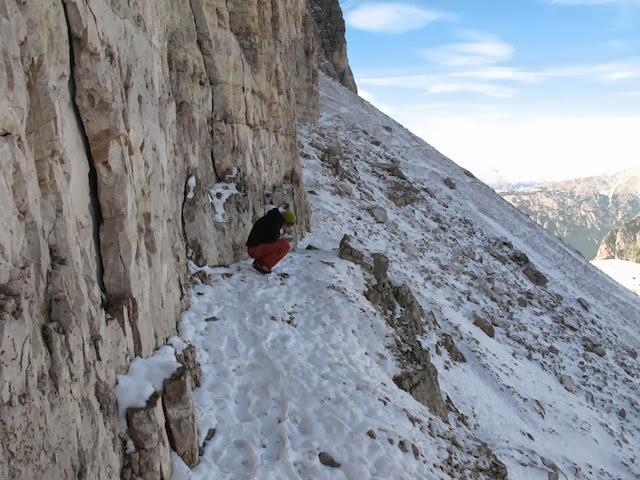 When we reached the second bivi below the Czech Pillar, we spent the following day both climbing the hard pitches that followed, before descending for one more night on the ledge. 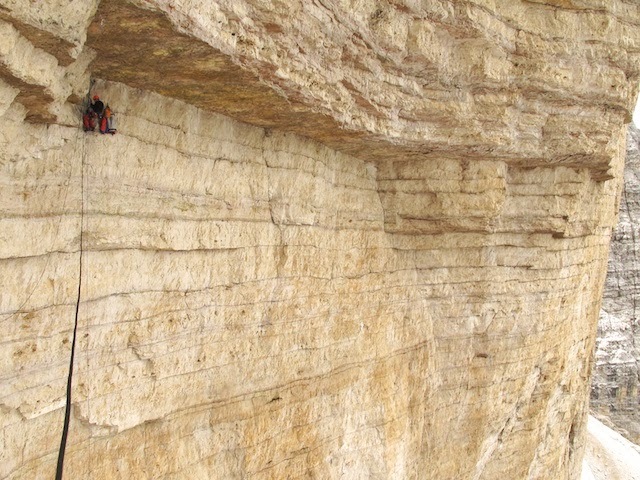 Both of us were tired that day, and I almost fell right at the end of a 7c+ pitch, where I knew Lama had also fallen. 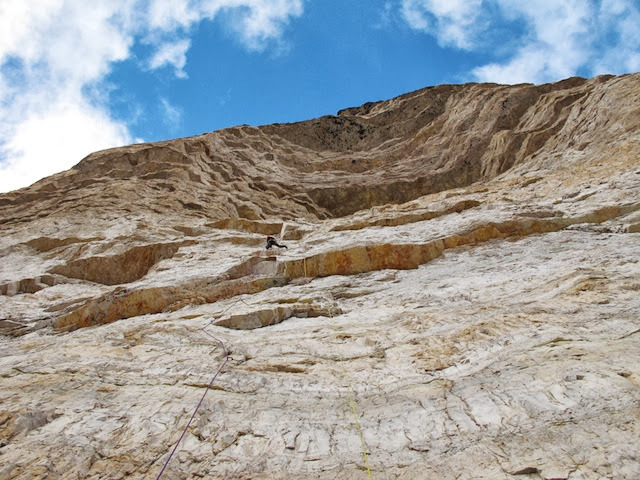 I knew I didn’t have the energy for another go within the hour, so I just held on like my life depended on it when a foothold broke 4 moves from the belay ledge. While Calum worked on the pitch, a helicopter appeared, hovering close by. The door opened and a long lens popped out and took some pictures of us. I thought to myself, that doesn’t happen in Scotland. We rose at 6am the next morning both feeling rather better than anticipated. Just as well, since the first task was to jung and haul the bag back to our highpoint before commencing the final 8 pitches, including one more of those nasty 7cs right near the top. We both climbed strongly on that pitch and we carried on that momentum all the way to the end, pulling into sunshine at 6pm on the top. The crux was yet to come for me however. I’d had blisters on my toes from wearing boots that didn’t fit my feet on the recce day. Nearly 4 days in my rockshoes had made them considerably worse. The walk back down to Grindelwald was a teeth gritter. Of course, now I’m sitting in a cafe the next day, everything feels better. I learned a lot some new beta on big walling tactics from Calum, and was certainly inspired by his confidence, backed up with skill and problem solving ability. He took the route very much in his stride, as I’m sure he will many more harder routes. Thanks to Ueli Steck and Stefan Siegrist for opening the route. It must’ve taken a lot of effort.